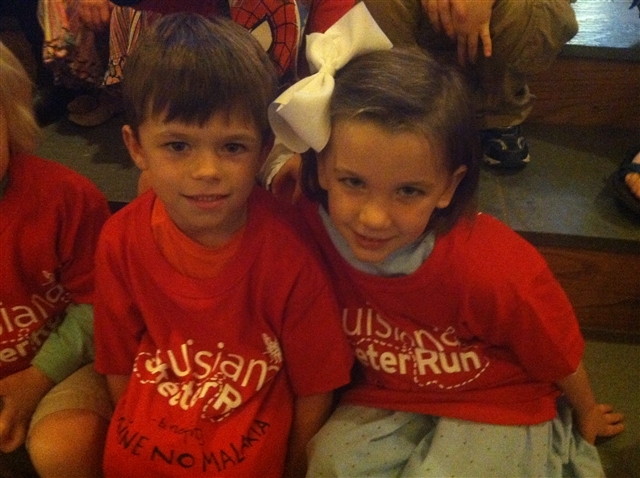 Louisiana Conference: Preschoolers learn about Imagine No Malaria/Skeeter Run at Wesley Center is this Saturday! Preschoolers learn about Imagine No Malaria/Skeeter Run at Wesley Center is this Saturday! Amy Stegall recently sent us this precious picture of some of the children in the Trinity United Methodist Church preschool class. The Ruston church served as host for the Monroe District Skeeter Run held Oct. 11, with Stegall serving as director for the Ruston event. "The preschoolers are shown at chapel, where we talked about missions in our community, throughout the United States, and around the world. Through the lesson, the children were able to learn more about Imagine No Malaria. . . and they loved the Skeeter Run t-shirts!," wrote Stegall. More than 1,000 runners, walkers and volunteers have enjoyed the third annual 2014 Louisiana Skeeter Run, to date, with events in five cities throughout the state--Baton Rouge, Lake Charles, Mandeville, Ruston and Shreveport.